The BlackTube E1 provides organizations with the ability to securely interconnect PBXs, Cellular Base Stations, Telecom Switches and E1 based communication systems over flexible bandwidth lines that are used to carry data, voice, and video. The Voice Only Leased Line Toll charges assessed by long distance and local carriers are eliminated or dramatically reduced by transporting voice traffic via LANs, WANs, MANs, Satellite and Wireless Ethernet. The BlackTube E1 encapsulates full and fractional E1 circuits, along with their framing and signaling bits, into AES encrypted IP packets. Encryption of the packetized E1 protects vital information from eavesdropping, tampering and regulatory compliance violations. BlackTube E1's secure the Critical Infrastructure utilized by highly competitive businesses, government operations, banking and finance, telecommunications, emergency services, gas and oil, electric and energy, water, and transportation. The BlackTube E1 ships with two E1 interfaces with either 1, 2 or 3 active and two 10/100 BaseT Ethernet Interfaces. The E1 interfaces have configurations that for provide independent protocol, compression, packet sizing, buffering, clocking, framing, coding and channel settings. The inactive E1 Ports can be activated via a software-based license key for a pay as you grow option. The BlackTube E1's transparent operation maintains the proprietary signaling required to support PBX features such as call conferences, call forwarding, caller ID and SS7. Legacy phone equipment investment is preserved. The BlackTube E1 uses the Type of Service byte in the IP packets or 802.1p/q mac levels for prioritization of the encapsulated E1 frames. QOS is used to ensure that the real time Circuit data from the BlackTube E1 is ensured high priority. The BlackTube E1's two Ethernet interfaces are able to utilize two ADSL Ethernet Modems, that have opposite high speed direction, to transport an E1's symmetrical bandwidth. Interconnecting the BlackTube E1 through a Virtual Private Network with sufficient real time committed information rate ensures that the required quality of service is provisioned. The second Ethernet interface provides a management port. Each LAN interface features independent IP network configurations. The BlackTube E1-MUX maps DSOs from a central site to as many as 31 remote locations via an IP/Ethernet connection. Get maximum use of expensive DS1 interfaces on PBX, Channel equipment and datacom gear. Also provides Virtual DACS Over IP capability. Mesh DS0s one-to-many or many-to-many. The E1 Switch Option enables the E1 Port 1 interface to be manually switched between a E1 circuit connected to E1 Port 2 or to E1 Over IP packets connected with the remote IP Tube. The E1 Link Protector provides an automatic back up for E1 circuits with E1 Over IP connecting via Wireless Ethernet, Gigabit Ethernet, IP Satellite Services, and xDSL. The BlackTube E1-C continuously detects idle and redundant data within each E1 Voice circuit resulting in as much as a 40 to 1 bandwidth savings. 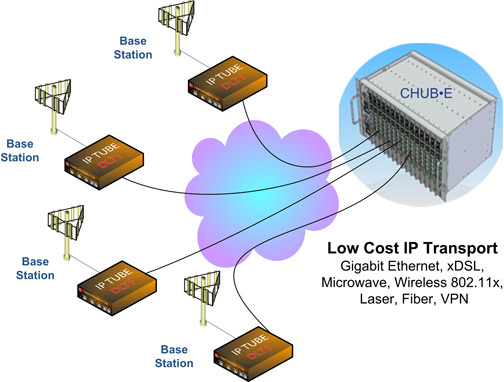 TDM over IP WAN bandwidth is not consumed by silent or redundant circuits. The BlackTube E1-ALT Alternator option alternatively sends the IP packetized E1 frames on LAN 1 and LAN 2. The Alternator option enables fractional and full E1 circuits to be split over two IP WAN connections such as xDSL. The Lossless Data Compression option can be combined with the Alternator option to minimize the bandwidth required from the alternative paths. The BlackTube E1-RLM Rate Limiter option limits the WAN bandwidth utilized by the LAN1 to LAN2 bridge. Rate Limiting the traffic enables the reservation of the WAN bandwidth for time the sensitive E1 Over IP real time connections. Great for Wireless WAN E1 applications. Rate Governing is only applied in the direction to the WAN to minimize latency. The data rate governor utilizes Time Division Multiplexing based clocking to provide for Nx64, NxE1 and NxFT3 bandwidth regulation that is configured from 64 kilobits up to 45Mbits. The Enhanced version has configuration parameters that enable a secondary packet path with high relative delay to primary path be synchronized. The packet sequence delay synchronization ensures concurrent redundancy with a high degree of error tolerance. Error free operation is accomplished when a primary or secondary Packet is not received and a redundant duplicate packet is available. The BlackTube also supports the transmission of multiple duplicate packets to support Mission Critical Circuit extension with redundancy that is only limited by the bandwidth provisioned. The BlackTube E1s are designed for Pay-As-You-Go growth from 1 E1 to 3 E1s. Customers can elect to economize initial installations, buy purchasing a single active E1 port and enable additional E1 Ports via a software-based license key. Field Upgrade benefits are extended to our Industry-Best Lossless Data Compression. Just as E1 ports are field upgrade able, so is Lossless Data Compression. At any time, each E1 port on the BlackTube E1 can be upgraded to Lossless Data Compression with a simple software-based license key installation. If you determine that your BlackTube E1 is best deployed with Loss less Data Compression, you're still in business with the per port field upgrade! The BlackTube family is ready for your most demanding central office or data center environments. With the Rack Mount Kit, BlackTube products are easily installed in 19" and 23" racks. Easy access to both front and rear sides facilitates technician maintenance procedures. -TPS BlackTube E1 Switch Protector The E1 Switch Protection provides an automatic backup for E1 circuits with a second E1. The switch over criteria is configured.